With its striking architecture and signature elegance, Paris is one of those cities which really needs no extra fuss and frills. The city of love has long been a go to destination for fashionistas, who long to wander the streets which inspired the likes of Coco Chanel and Christian Dior. Furthermore, there can be no more sophisticated backdrop on earth than the skyline of Paris to debut the season’s latest luxurious trends. However, for some modern-day influencers, there is a strong temptation to play around with the French capital’s sophisticated beauty; moulding it to fit their particular preferences. 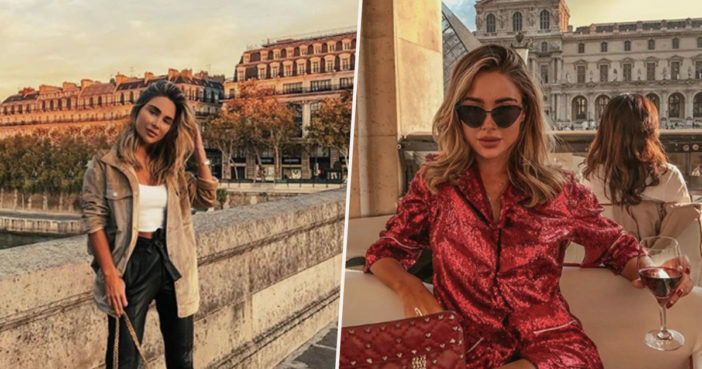 Swedish Instagrammer Johanna Olsson is one such individual, having used Photoshop to enhance pictures of herself posing in various Parisian locations while on an all-expenses paid trip. And people were less than impressed by the 28-year-old jet setter’s editing skills, which are at times hilariously obvious. One amusing picture – captioned ‘fall leafs in Paris! Love this city this time of year! !’ – appears to show the stylish lady hovering a few inches off the pavement like a designer Darlick. Ooh la la. Another amusing snap shows Johanna relaxing at a picturesque Parisian café, nice glass of red in hand. However, the scene is somewhat tarnished by a blatantly scrubbed out parasol and a superimposed tree. Many of Johanna’s followers felt misled, and some suspicious individuals even suggested she hadn’t even been in Paris is the first place. So your photos are fake? Why would you do that… honestly how pathetic and immature. Seriously, the table isn’t even straight, the lines are all crooked. If you have to photoshop a life, are you genuinely happy?? I wanted to talk a little bit about the pictures I posted in Paris. So, I did one picture, shot it and didn’t think it looked that nice… so I took a different background and put the background into it. And when I put it up nobody noticed so I thought, this is good. So I admit it wasn’t my finest Photoshop skills. Now in Sweden this thing has gone crazy and TV shows want me to come on and talk about my ‘fake travelling’. It’s a bit ridiculous I think. There are a lot of influencers out there that use Photoshop in birds, rainbows or crazy skies and I could do that but I don’t like that. I just wanted to make that clear that I was in Paris, but I did Photoshop the background, but I’m not going to take them down because it’s a collaboration and they’re nice pictures – it’s a good outfit! Here here! Who needs the boring old truth when you can have a ‘good outfit’?